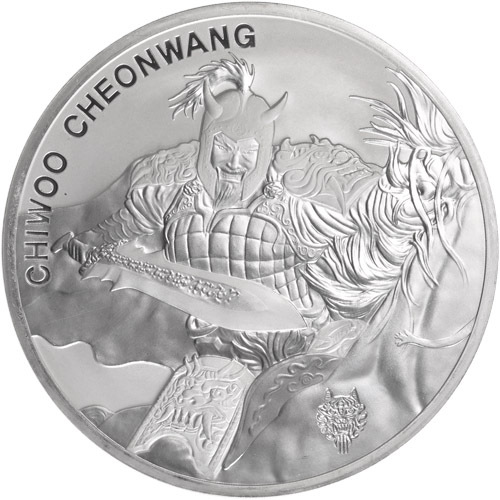 Chiwoo Cheonwang is the first-ever silver bullion series from KOMSCO and the Republic of Korea, better known as South Korea. The collection was so popular that the mint introduced a new coin collection in 2017 known as the Zi:Sin Series. Now, the two come together in the form of Zi:Sin privy marks on Chiwoo Cheonwang medals. The 2018 1 oz South Korean Silver Chiwoo Cheonwang Canis Privy Medal is currently available to you for purchase online from JM Bullion. Medals arrive inside of protective packaging, mint tubes of 25, or boxes of 250! 3rd privy design from the Zi:Sin Series and KOMSCO! Obverse side depicts the shield of Chiwoo Cheonwang. Reverse includes the image of Chiwoo Cheonwang with a Canis privy. The Chiwoo Cheonwang collection from KOMSCO features new designs on the reverse side of the coins with each new release. The changing designs are meant to follow Chiwoo in his preparation to ride into battle with his armies. A revered military leader who earned status as the God of War in Korean cultural lore, Chiwoo is said to have won every battle he took his troops into for a decade. Zi:Sin Series coins depict the image of the 12 Guardians from Korean cultural lore. Like the 12 animals of the Zodiac, each of the guardians shares symbolism with particular animals and features unique powers that can be used when the guardians lead the armies of god into battle against evil. On the reverse of the 2018 1 oz South Korean Silver Chiwoo Cheonwang Canis Medal is the design of Chiwoo Cheonwang. For this year’s design, Chiwoo is depicted riding on his horse into battle as he lowers his sword to cut down an enemy. This is undoubtedly the last view of Chiwoo Cheonwang that many of his enemies saw on the field of battle before death. Included on this side of the medal is a small privy mark representing Canis. The Canis release of the Zi:Sin Series is meant to coincide with the Year of the Dog from the Chinese Zodiac and, in fact, Canis shares many characteristics of a dog as a loyal and reliable warrior for god. 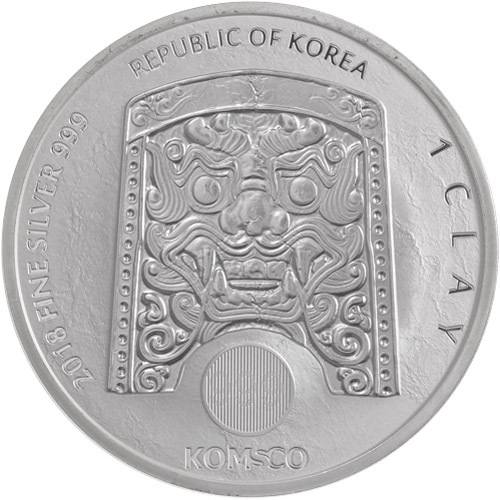 The obverse of 2018 South Korean Silver Chiwoo Cheonwang Canis Medal. The medals feature the image of Chiwoo’s shield on this side. On his shield is the image of Do ggae bi, a hobgoblin creature known to ward off evil spirits. These 2018 1 oz South Korean Silver Chiwoo Cheonwang Canis Medals are available to you with Brilliant Uncirculated condition and various purchasing options. You’ll find individual medals housed in protective packaging, multiples of 25 available inside of mint tubes, or multiples of 250 in boxes. The boxes contain a total of 10 individual tubes. We encourage JM Bullion customers to reach out to us with questions about silver for sale at 800-276-6508. You can also connect with us online using our live chat and email address features.